I joined the Daughters of the American Revolution for the genealogy - it is a lineage society, after all. In joining, I utilized their Ancestor Database to find Revolutionary War Patriots to join through. I also pursued their Descendants Database, which is made up of the other generations of ancestors that have been documented to reach the Patriots. Unfortunately, I have very few ancestors in this database; for the most part, no one has joined under my lines in a way that connects to me any closer than the grandchild of the Patriot. Since the Patriots are mostly between 7th to 9th Great-Grandparents, that's not a close relationship. It is helpful to find closer relatives of course, because it could help me break down brick walls. Just think, if I had a brick wall line at 3rd Great-Grandparents and they were in the database... brick wall busted! For the most part, the DAR database is well documented (and if it's not, there's usually a notation). 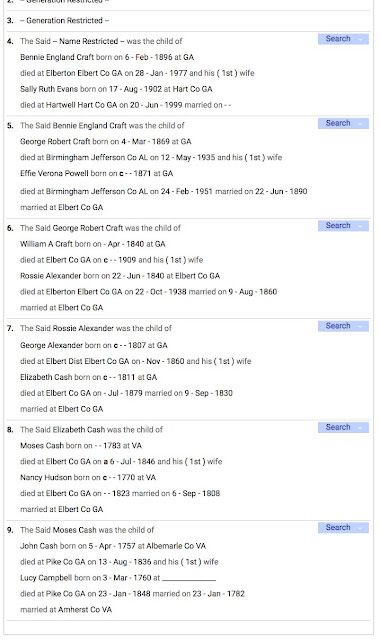 Ultimately, the Ancestor Database and the Descendants Database (which are connected), are one giant family tree, with options to order the documentation used to prove the lineage (see my previous post). 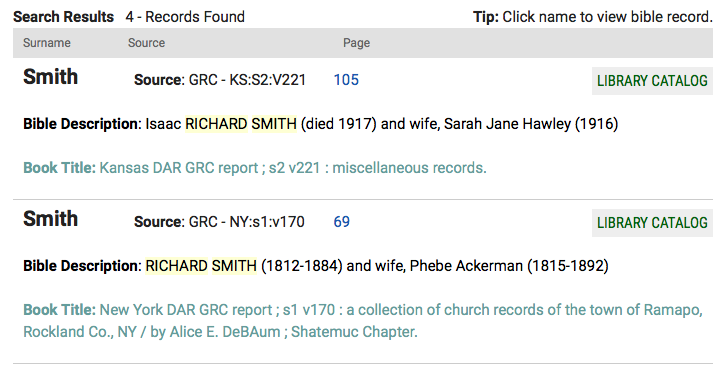 One of the benefits of joining the DAR and having my application approved is that my ancestors are now in the database! It takes a while, as each generation has to be indexed, but there're there. My application resulted in five generations being added to the database, starting with my Great-Grandparents, Bennie Craft and Sally Ruth Evans. I would be so thrilled if one day these generations helped someone break down a brick wall or join the DAR. 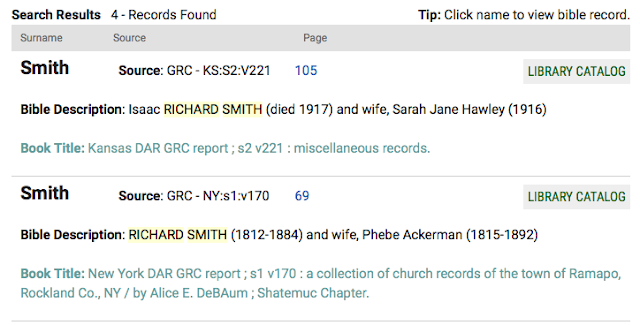 Go explore the databases on the DAR website - and check back often. One day a new member's application might help break down your brick wall. The Daughters of the American Revolution just published a new database online, filled with over 40,000 Bible Records. You can read the DAR's announcement here, and start searching the database here. This collection was created by the scanning and indexing of books created by DAR members over the years, many of which recorded Bible records. As this collection of books has been indexed, the Bible records where tagged for this special database. 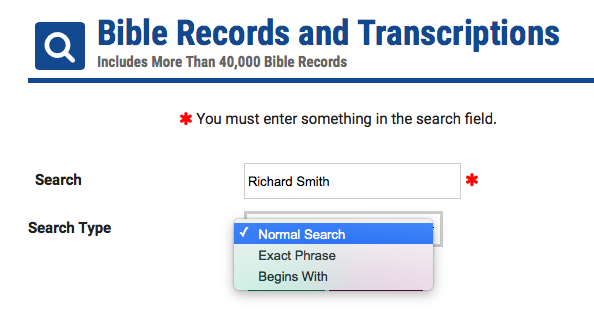 The search function for this database is very simple. Type in a search term, ideally a name, then choose your search type: normal, exact phrase and begins with. Wildcard functions do not appear to work with this database. There's a lot going on here: the main surname featured in the Bible; the Source, which is something like a dewy decimal code for the database system and which identifies the state that the book was created in; the page number that the Bible is on in the book; the Bible Description identifies the main couple that the Bible belonged to; the Book Title expands on the Source field and gives a bit more information on the source of the Bible. If it's not immediately obvious if this is the person or couple that you're looking for, click on the page number. This will show you a list of other names that appear on the page. Make sure to see if there's a "Next [#]" button at the bottom of the page for more results. Once you've found a Bible record that you'd like to view (and you're not at the DAR library in DC), you'll need to send a Photocopy Service request, which is $15 for non-DAR members. You'll need all of the information from the search results screen to fill out the G.R.C. request section on the form. Based on past experience, the turn around time for these requests is very quick. My family has been lucky not to experience the loss of a soldier, sailor or marine since the days of the Civil War, though many have since fought for our country. Since Memorial Day evolved from the Civil War, it seems fitting to remember those ancestors today. Private Wiley Powell was 42 years old when he enlisted in the 38th GA Infantry Regiment as a substitute. I have to assume that either his family needed the money, or he supported the war effort and saw a financial opportunity. Wiley fought at 2nd Manassas, Chancelorsville, Winchester, and Gettysburg. From his service record, it seems that Wiley was often ill (chronic rheumatism, tuberculosis) and, on 14 January 1864, he succumbed to his illnesses at Hospital No 3 in Lynchburg, Virginia. He is buried in Lynchburg at the Old City Cemetery. Franklin E Leaphart was 25 years old when he enlisted in 1861. As a young father with two children, he must have been a supporter of the war. He fought at Sharpsburg, Chancelorsville, Gettysburg, Chickamauga, Wilderness, Spotsylvania, North Anna, Cold Harbor, and Petersburg. He was promoted to 2nd Corporal in June of 1863 and later promoted 1st Corporal and then to Sergeant. He was shot at the 3rd Battle of Winchester and was a prisoner at the US Depot Field Hospital in Winchester, Virginia. He died of Dysentery there on 12 October 1864. His burial location is unknown. Many other ancestors have fought in our country's wars, but have been lucky to survive. Today we give thanks to those men and women, though it feels that no number of "thanks" will ever be enough. 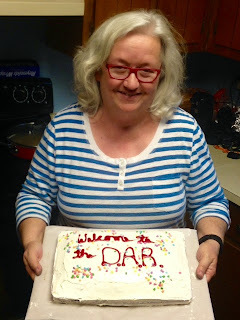 Mom's application for DAR membership was received in DC on April 5th. Today, May 22nd, her application was verified - much to everyone's relief. As opposed to my application, which went through my dad's line, hers was pretty difficult. All of her family lines are complicated, many of them being "red-lined" in the DAR database (meaning there's a problem with the prior applications). I thought that the line we chose, which traced back to Samuel Armstrong of South Carolina, and before that, Ireland, would be the simplest one.... Yeah, not so much. And it the trouble wasn't even about the Revolutionary War Patriot! First of all, with the DAR, you really have to prove every fact that you put on your pedigree chart. If you "know" that someone's name was John James Doe, you need to prove it. If you records only ever give the middle initial of 'J,' well, that's what you'll have to put on the form. So the fact that mom's grandmother, Auline, was called Arlene by her 2nd husband, complete with a Death Certificate and Headstone that read Arlene, created issues. In order to have her name properly recorded on Mom's application and in the DAR database, I transcribed an interview I'd previously recorded with my great-aunt where she discussed her mom's name. We then had my mom, who conducted the interview, get the the transcription notarized. Moving back through her tree, we had a few places where the documents that I had needed to be reviewed and evaluated to see if they were good enough. I discovered a few places where I didn't have the documents that I thought I had, though I had others that served as proof. For example, I don't have the death certificate of my Great-Great Grandmother, Nina Sprouse Albea. I do have her obit and social security application, but was surprised to not have her DC. Possibly the most uncertain aspect of Mom's application was the son of the Patriot. Previously, all DAR applicants had gone through Samuel's son, William, who also served and had a pension. We were going through Samuel's son, John. John is listed in Samuel's will as John Armstrong. However, in all other documents he is listed as John H Armstrong. Since there was a name variation, our registrar felt that we would need to show that John and John H were the same person. She wrote an analysis, evaluating all John Armstrongs in the area and detailed a theory on the addition of the middle initial after our John became guardian to a younger John Armstrong. In another couple weeks, Mom will have her membership number and her lineage will be added to the database. She's very happy to be a full member and to take part in this fantastic service organization.